The fashion industry has always been an impactful one— people use fashion to express themselves by putting together outfits or wearing their own style. However, the real outliers in fashion are those that create. Fashion designers start with an idea in their head, and if this idea is successful, everyone uses this idea they plant to express themselves. Just like everything, fashion comes with its own controversies. One of the greatest controversies is that of cheap labor. We often hear that there are sweatshops across the globe that pay peanuts for us to get the fast fashion we so love. Because of this, a lot of people are going into making their own clothes or wearing things that are locally designed and created. Some people even go so far as to learn to sew to avoid shopping from retailer brands altogether. If we go back a little further, sewing was a necessary skill for centuries. Up to only decades ago, people— women in particular— were expected to know how to sew. From mending tears to creating their own ensemble to wear, women tailored their own and their family’s own clothing. While no longer considered a necessary skill, more and more people are taking the creative plunge and tailoring their own clothes again. The current resurgence of the desire to create one’s own clothing has led us to a particular need: the best mini sewing machines. Here it is, the part we’ve all been waiting for: the best mini sewing machines on the market. The top three sewing machines are all based on real reviews and the general consensus among crafting experts and tailors alike. In terms of value for money, the Janome Sew Mini machine offers the best cost-function ratio. The Janome Sew is a favorite among mini sewing machine users because it carries the functions of its larger counterparts but on a smaller scale. It is incredibly easy to use, which makes it a favorite for advanced users and beginners alike. The only problem with this machine is that it is so popular that it is often sold out. Other available variants of the same brand would be the Janome Fast Lane, which comes in 8 cute colors. The Singer Start™ 1304 offers a quick setup with no fuss. The machine itself stitches quite fast once pressure is placed on the foot pedal. This machine is completely beginner-friendly, with fewer frills and features compared to other machines. However, it may not be the option for more advanced users. 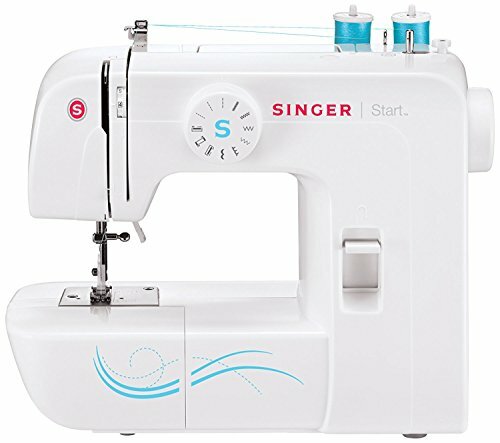 The Singer Start™ 1304 is small enough to fall in the mini sewing machine category but is on the heavier side of the spectrum. This offers a really solid base for beginners. Kenmore is known for many of their other household products. 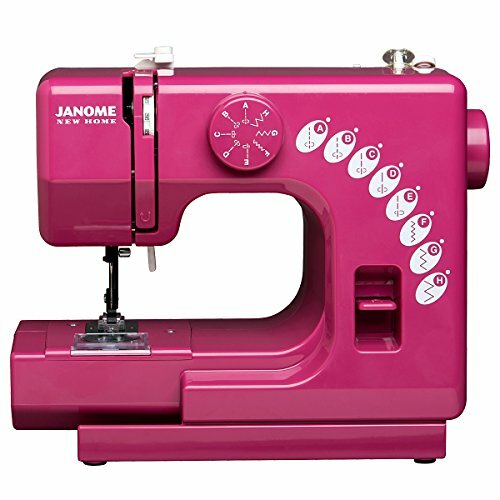 This machine is also made by Janome, which makes it well-loved by many beginners and is widely known for its bang-for-buck. The Kenmore Mini Ultra is considered mighty for its size because it can sew on thick fabrics like denim. This machine has a more diverse range of functions than the average mini sewing machine, which makes it a crowd favorite. Why a Mini Sewing Machine? Mini sewing machines, in particular, are meeting a high demand and understandably so: they’re versatile, portable, and easy to use. Many beginners start off with a mini sewing machine because of easy it is to use them. The set of functions that a mini sewing machine is perfect for the beginning home tailor to use without much confusion and frustration. Not only for beginners, but many intermediate to advanced tailors also purchase mini sewing machines for their size and portability. Because of the weight and size of a mini sewing machine, people are able to take their projects with them wherever they feel like going. Obviously, the term “mini” already explains this part. Getting a smaller-sized sewing machine means that it does not have to take a large part of what valuable workspace you have. Most workspaces nowadays are rather tiny, so getting a mini sewing machine may seem like the smarter choice. Because mini sewing machines are lighter and easy to bring along, you can take your mini sewing machine with you— even on vacation! Some mini sewing machines weigh from under 7 pounds to under 2 pounds in total weight. This one benefit of the mini sewing machine is enough for even the most advanced home tailors to buy it. Its portability also means you can take it with you to a sewing class or crafts class that requires you to sew. Remember, in terms of portability; you may want to look for a mini sewing machine that has an onboard storage compartment that allows you to pack your threads, needles and other essentials to take them with you. While the mini sewing machine may have a smaller range of functions than a regular-sized sewing machine, they still come with varying capabilities. Some mini sewing machines have varying tension settings and stitch settings. Despite their small size, there are also mini sewing machines that have a light attached to help you work in dark spaces or spaces where there is little to no natural light. This is perfect for on-set costume designers in theaters and film sets. There is the belief that mini sewing machines are not able to handle thick or heavy fabrics. While this may be true for some, other models can keep up with the speed and power of larger machines. Some mini sewing machines can take on denim and other thick fabric. Do not let their small size deceive you. Most mini sewing machines can be thought of as “plug-and-play” because of how easy they are to use. Mini sewing machines are usually designed to switch stitches easily and come with complete parts, making them perfect for use right out of the box. This makes it perfect for teaching children to sew, as well as for beginning adults. The often slower pace of mini sewing machines makes it easy for beginners to get the rhythm of sewing with minor mistakes. This also allows you to take your time while learning. Learning a new skill can be costly, and equipment can be much more so. Starting off with a mini sewing machine as an investment makes it possible to learn to sew for less expense than buying a larger machine. Moreover, you won’t regret the cost of buying a mini sewing machine in the way you would regret buying a machine you might not use very often. What, did you think mini sewing machines were perfect? Close to it, but everything is not without its faults. Although mini sewing machines get the job done more often than not, they are not complete in their functionality. Mini sewing machines rarely have some automatic functions that advanced tailors deem necessary. This makes it difficult to sew buttonholes and zippers. However, beginners learning to sew may overlook this function at first and thus does not discourage them from buying mini sewing machines. As mentioned earlier, many models are unable to deal with heavier fabrics like denim, leaving users with limited options in terms of what they can create. While the slow pace was mentioned earlier as an advantage to beginners, this may not always be advantageous to other users. There are always two sides to a coin, and this is the flip side. You may not get your work done as fast as you would with a larger sewing machine. Fear not, however, for there are certain models that can compete with larger machines in terms of speed. This may not be true for all mini sewing machines, but many users complain about the quality of the machine itself. This can be solved by buying your machines from a reputable brand and seller, and should not deter you from getting the mini sewing machine of your dreams! The clearest difference between a mini sewing machine and a large sewing machine would have to be the size. Time and again, we’ve mentioned that mini sewing machines have the advantage of portability over that of large, heavy-duty sewing machines. One major difference between a large sewing machine and a mini sewing machine is the function. Large sewing machines have various models for specific functions like embroidery, and button attachment, for example. Large sewing machines have more variations for stitches, stitch sizes, tension among others. Mini sewing machines are more for general and light use, with less than ten variants. Full-size sewing machines have industrial variants that are meant for mass-producing clothing items and other products that require fast sewing. However, most models are for domestic use. Mini sewing machines fall under the category of domestic use as this is often used by beginners and home tailors. Large sewing machines include mechanical variants, but these models are old and are often not the choice for those looking to buy new machines. Portable mini sewing machines are mostly electrical, like modern full-sized sewing machines. Overall, the decision to get either a large or mini sewing machine relies on what they are intended for. If you are simply buying a sewing machine for hobby purposes and not for serious heavy-duty work, a high-powered mini sewing machine should suffice. If you are a beginner, a mini sewing machine is a great introduction to the larger world of design and dressmaking. Sewing is a wonderful practical skill that you can take advantage of, from mending to expressing yourself by executing your designs. The decision to take charge of your own wardrobe and make clothing is a big step towards learning something new. Getting a larger sewing machine may not yet be worth it as you start out, but mini sewing machines are a great way to get started. Mini sewing machines offer good value for money and great functionality regardless of your level as a tailor. When the decision to move forward with a larger machine arises, you don’t have to let go of a mini sewing machine because you can take advantage of its portability when working on a project. Advanced tailors and crafters alike can still maximize the capability of their mini sewing machines in many ways. Who knows, perhaps you’ll be spreading your knowledge of mini sewing machines to other beginners in the future. Remember to choose a mini sewing machine that will last you a long time. If you liked this article, subscribe to our website for newsletters and connect with us on Facebook at.